You might have heard of the different types of screen protectors and would want to know the best ones out there to protect your screen. Today, screen protectors are easier to install, and you can do that YOURSELF without going to the phone shop near your house to get it installed. PET, TPU and Tempered are three major types of screen protectors that are being used today. All three of them have their features, pros and cons, and you can always decide which you want to buy by inspecting them well. The following article lists the best, most durable screen protectors that you can buy for your new iPhone 7. Have a look! 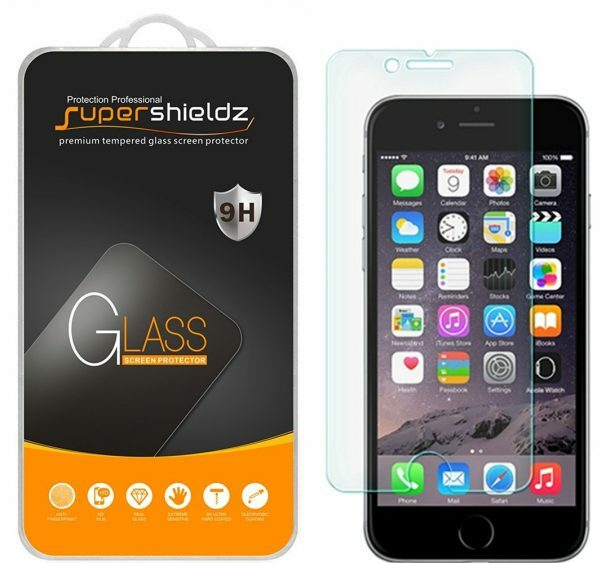 This is Supershieldz premium quality tempered glass screen protector with anti-scratch and anti-fingerprint properties. It is ultra-thin at only .33mm thickness, and seamlessly merges with the phone’s display, hence difficult to know it is installed. The hydrophobic and oleophobic coatings protect against sweat and oil residue from fingerprints. It features a brilliant display and has excellent touch responsiveness. It also guarantees bubble-free installation and leaves no residue when removed. This is Peyou’s tempered glass screen protector with 9H hardness and scratch resistant display. 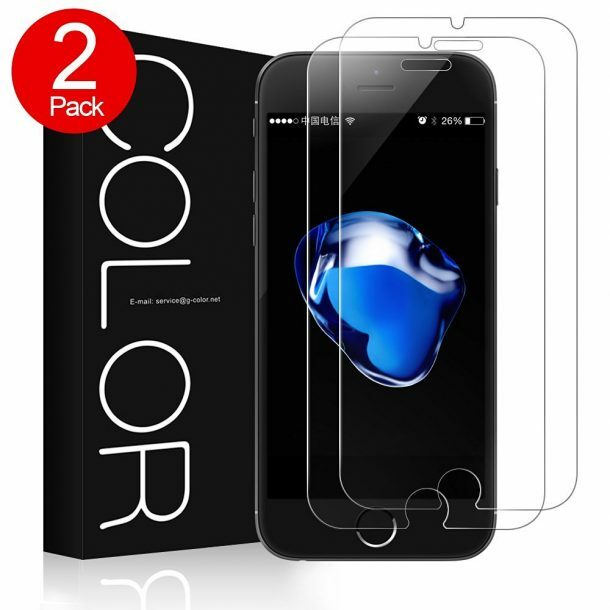 The package comes with two pieces of tempered glass. This unit is precisely cut to fit the screen of your phone well without being over or undersized. It allows repeatable installation where you can always peel off and install if you spot a bubble. It protects well against dirt, scratches and high-impact drops and shocks. You will experience 99% HD bright display with an extremely responsive touch. “Does what it’s supposed to do. Quick delivery as well.” – Amazon’s Customer Review. This is Spigen’s tempered glass screen protector for iPhone 7. The unit features knife resistant hardness and preserves the high definition clarity of the phone’s display. It also has an anti-bacterial cover which provides invisible and perfect protection to your phone. Additionally, it poses no threat to the touch response and is a must have accessory for your phone since it protects well from high-impact drops and shocks. “Spigen makes reliable phone accessory products. I have been using them for 3-4 years in various phones. ( iPhone 4s,5,6, Samsung Galaxy s5,s6 edge plus). Their screen protector has excellent protection, and the touch response is as same as using it as naked. If you only used film screen protectors, you are missing out. I used various cases from other brands, and Spigen is my favourite brand. I highly recommend it. P.S. I purchased Spigen with my money, and this isn’t a sponsored post. I truly like their product and after using it various items, I wanted to give them a good review.” – Amazon’s Customer Review. 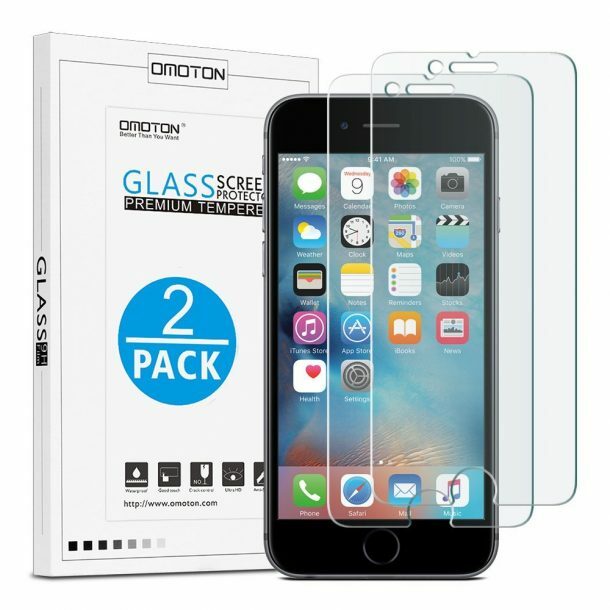 This is Omoton’s tempered glass screen protector for iPhone 7. The unit is especially laser cut to ensure a precise fit. It features knife-resistant hardness (9H) and will effectively protect your phone from unwanted scuffs and scratches by knife, keys and other hard substances. Easy and bubble-free installation. The unit retains the high-definition display of your original phone’s display and maintains the touch screen responsiveness. The hydrophobic-oleophobic screen coating protects against sweat and oil residue from fingerprints and it as a whole, protects your phone during high-impact drops and shocks. 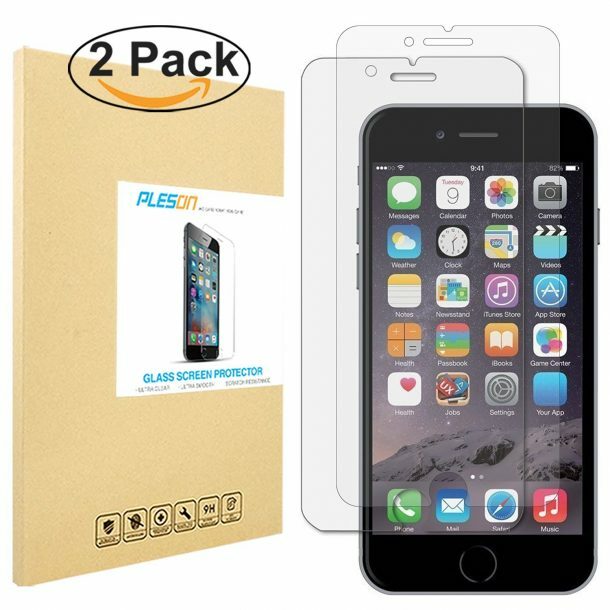 “Not only does this screen protector likely fit the iPhone 7, but it also fits the iPhone 6s and 6. The screen protectors both came in perfect condition, probably due to the very sturdy cardboard/wood packaging they come in. My favourite part about OMOTON is the kit that comes with the screen protectors! Inside it are several things: installation instructions, stickers to guide the screen protector so it is just right, a unique sticker to absorb dust from the phone, wet wipes to remove dust and sterilize the screen (and remove oil and fingerprints), a screen cleaning cloth, and a bit of hard plastic to use to press out any unlucky air bubbles. So much for the price! There are two of everything that cannot be reused so that you can use it for the second screen protector. The screen protector went on very smoothly, and the few bubbles that were on it were my fault. I used the bit of hard plastic to scrape them out, and now it’s perfect! If I ever crack mine and need more, I’ll buy these for sure. They are sturdy and have survived several accidental drops!” – Amazon’s Customer Review. This is Pleson’s ultra-thin, tempered glass shatterproof, screen protector with anti-scratch capabilities and high-definition screen display. The unit is made from industry leading specially processed Japanese glass to ensure maximum protection. It is precisely cut to ensure perfect fitting and has rounded edges for a user-friendly screen experience and to increase compatibility with phone cases(the sides won’t poke you). The high-definition transparent hydrophobic and oleophobic screen coating protects against sweat and oil and water residue from fingerprints. The unit provides maximum protection from high impact drops, scratches, scrapes, bumps. “Stunning protector easy to get on. Also no bubbles. I received this product at a discount in exchange for an honest and unbiased review.” – Amazon’s Customer Review. 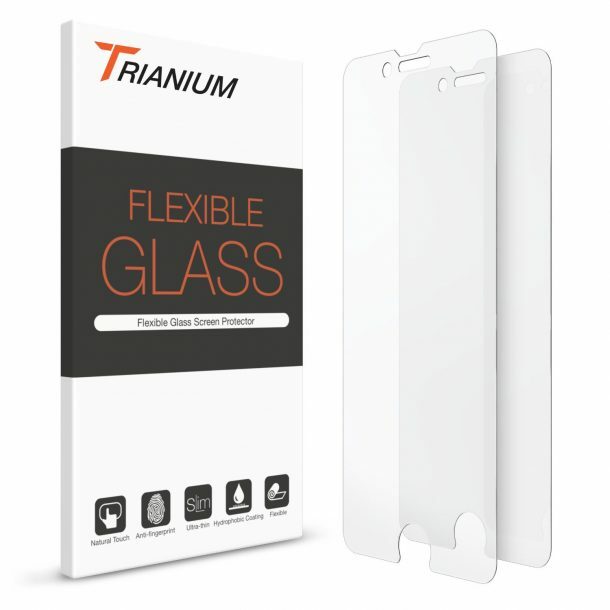 This is Trianium’s ultra-thin, soft glass film, screen protector with 3D touch compatibility. The 0.2mm ultra-thin defender seamlessly merges with the phone’s display and protects the phone well, especially from high-impact drops and shocks using its knife-resistant (9H) hardness. Made from premium quality materials, it preserves well the high-definition clarity of your phone’s display. The ultra-clear hydrophobic and oleophobic screen coating protects against sweat and oil residue from fingerprints. A good buy! “This is my 3rd time purchasing the product of Trianium. The first time I bought as soon as I got my new phone and I dropped it the same day. I was mortified, but to my surprise, nothing happened to my phone, the protector was great. I purchased another one to replace it, and I’ve had it on since then. It’s been almost a year, and there hasn’t been a sign that it’s peeling off or a crack. The only reason I’m replacing is that it’s received some scratches over time. Now I need a new one for my incoming new iphone7! Great product and I will never buy another screen protector!” – Amazon’s Customer Review. 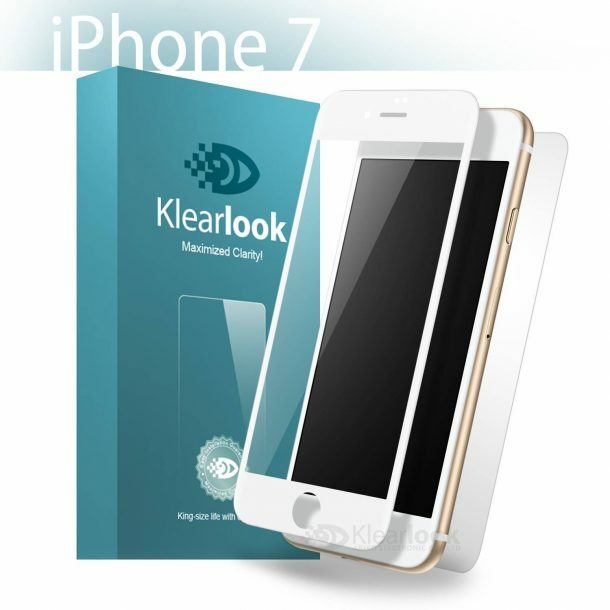 This is Klearlook’s full coverage screen protector with knife-resistant hardness and anti-scratch screen. The 3D hot bending technology enables the protector fitment to the curved screen edge by edge. Allowing a retina-clear display and high touch responsiveness, this unit has been specially nano-treated to pose no threat to the before-mentioned features. This unit is made from environment-friendly materials and can be recycled once un-usable. You can buy specific defenders for iPhone 7, Plus (White, Black). “The package arrives in excellent condition, seems the seller is well aware of how violence the logistic could be. All kids inside look perfect, I mean you will have 1 set of 3D white frame front protectors, and the back protector could be an extra surprise. But I might not need it instead of a case. Expecting my new phone is coming soon ” – Amazon’s Customer Review. 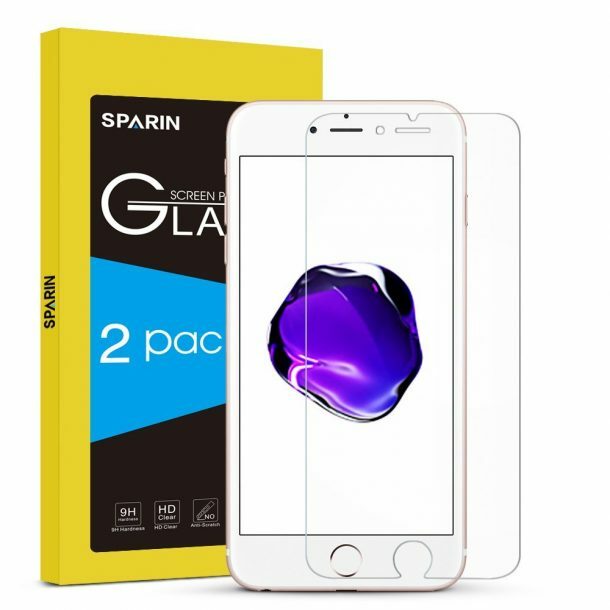 This is Sparin’s pair of high-quality tempered glass protectors for iPhone 7. The unit comes with an easy-to-follow guide to make it easy for people, who are hesitant to install shields by themselves. You get a micro fibre cleaning pad for installation. When applied correctly, you can’t even tell that the glass is on the phone, and it feels great to the touch. The unit has rounded edges to provide compatibility with cases and ultra-thin, 0.26mm. A good deal. 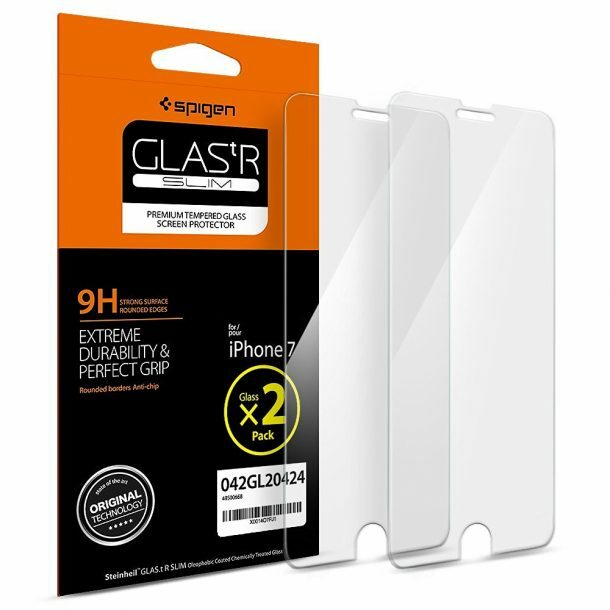 “This is a great quality two-pack of screen protectors. They are easy to put on the phone and are a nice way to worry less about breaking your phone screen and having to replace it for hundreds of dollars. These are a great deal and will save so much worry and money. Ideal for teens who are always on their phones. I received this product at a reduced cost in exchange for my honest review.” – Amazon’s Customer Review. This is G-colour’s 0.2mm thick, 2.5D, tempered glass screen protector with knife-resistant hardness and scratch-resistant display. The unit provides maximum protection and maintains long-term durability without the protector peeling off as is the case with the cheap ones. 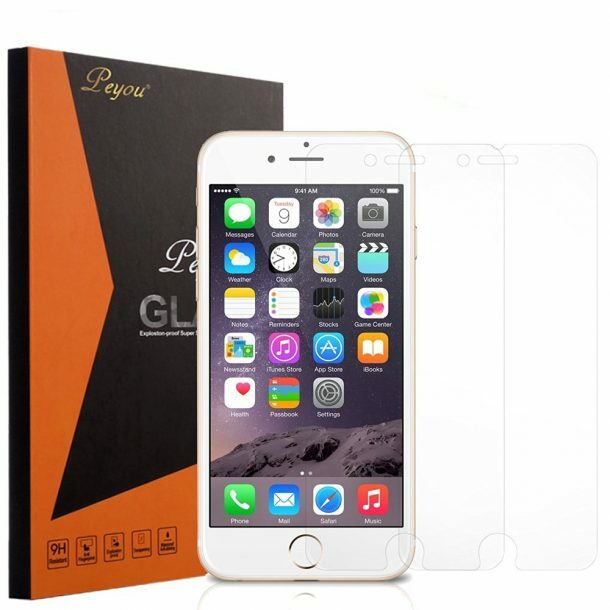 This glass protector only covers the flat portion and efficiently protects your device from unwanted scuffs, scratches by knife and keys. Ultra-responsive and maintains the bright retina display of the phone’s original screen; highly recommended. “Kit comes with screen protector, application tools, and easy to follow instructions. It fits as expected, but note that these screens tend to leave a small portion of the glass uncovered on each side. That is due to the phone’s shape and seems to be consistent across most makers of these protectors. The application is easy. It is clear with good touch response.” – Amazon’s Customer Review. 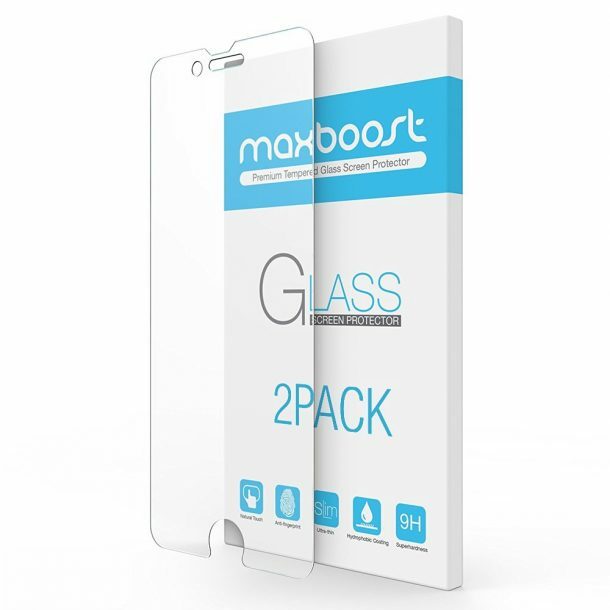 This is Maxboost’s 0.2mm thin, tempered glass screen protector for iPhone 7. The rounded edges allow compatibility with all the cases. It does not cover the entire screen but only the flat portion. The hydrophobic and oleophobic screen coating protects against sweat and oil residue from fingerprints. Easy installation and accurate touch screen responsiveness make this one of the best screen defenders. Protects the phone well! “This is an awesome screen protector. I’ve had 2 of these. First, it’s super easy to put on. Unlike other screen protectors I’ve bought, this one comes with guide strips, cleaning and drying clothes, and a cool sticker for getting every last speck of lint off the screen. It goes on PERFECTLY! Second, it protects the screen. I dropped my iPhone with it on, and the screen protector cracked, but not the iPhone! It wasn’t dangerous when it cracked, either. Just saw the lines. I was so glad my screen was spared. When I replaced it with a new identical cover, it came right off without dangerous shards. ” – Amazon’s Customer Review. All the time I use glass screen protectors for every phone I bought but iPhone 7 got new home button, Glass protector will create a hollow in the home button so this I bought thin screen protector from Gadgetshieldz.